Howard Frank Mosher is one of America's most acclaimed writers. His fiction, set in the world of Vermont's Northeast Kingdom, chronicles the intertwining family histories of the natives, wanderers, outcasts, and fugitives--white, Native American, escaped slaves fleeing north, French Canadians, and others--who settled in this remote and beautiful place. 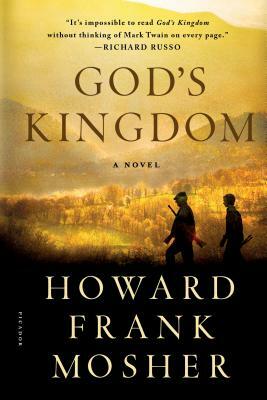 God's Kingdom explores the Kinneson family through the coming of age of the heir, Jim, and its rich and complicated history. Earnest and innocent, a bright high school student, Jim grows curious about the unspoken "trouble in the family" that haunts his father, a small-town newspaper editor, and his grandfather, a raconteur who keeps the Kinnesons' secrets to himself. Layer by layer, tale by tale, sorting out fact from deliberately obscured legend, Jim explores the Kinnesons' long relationship with others in the Kingdom, culminating in a discovery that forever changes his life and place in that world. Beginning with a magical Thanksgiving Day hunting trip in the autumn mountains, and ending with Jim on the brink of leaving home to find life-and perhaps love-on the other side of the ridge, God's Kingdom unfolds with the patient delight of a master storyteller.